I've been thinking about this portion of the multi-part post all week. 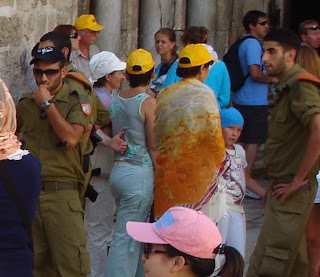 I'm concerned that I won't be able to accurately and effectively convey to those of you who don't really have experience in Israel, even as a tourist around soldiers, with the disposition of Israeli soldiers while on tour around the country. You see, Israel has a mandatory army, so all but the highly religious are drafted for two to three year services at the ripe old age of 18. Consequently, the army does nice little things once in a while, like taking the soldiers on educational trips to important sites. 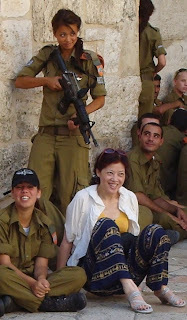 These soldiers are in uniform during the trips, as well. I have observed that more often than not the soldiers aren't really so excited about being the object of foreigners' curiosity. Yes, many will take a picture with someone that asks nicely, but rarely have I seen them get really animated. They tend to just stand there and look like they'd rather be anywhere else. So, when I saw this I was a little blown away. 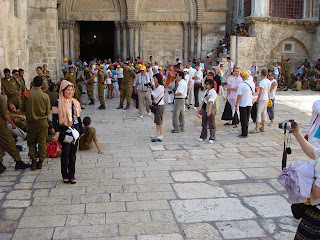 At the Church of the Holy Sepulcher, the site of Jesus' supposed crucifixion, burial, and resurrection, a large crowd of tourists had their attention fully on the soldiers instead of on the church. These visitors were mainly Southeast Asian, as far as I could tell. Now, as far as stereotypes go, I know that Koreans are branded as being very religious Christians. So, it really amazed me to see that the focus was not on Jesus and Christianity, but rather on these punk 18 year olds who just happened to have on a uniform! You should have seen it. People were running around trying to capture the perfect shot: two soldiers laughing, two soldiers hugging, two soldiers acting tough. It was hilarious. 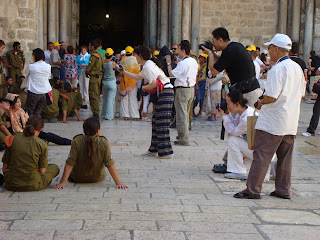 What really surprised me was that the soldiers were bouncing around, smiling, holding cameras and taking pictures for the tourists, posing with and hugging those who asked... It was just not a normal sight. These kids are usually so bored. They seemed really energetic, instead. were bottlenecking it while taking pictures of the soldiers. right is thinking, "Holy-Freaking-Crap. Is she really doing that?" Unbelievable. A photo like this could end up in the Times, with the expression on the tourist's face photoshopped, and used as proof of "Israel aggression". The girl is a real idiot. that asain chick is hot...but damn is she an idiot.